The picturesque village of Depoe Bay on the Oregon Coast is great place to visit. The coastline here is rocky with little to no beach. An enormous sea wall runs the length of the downtown. 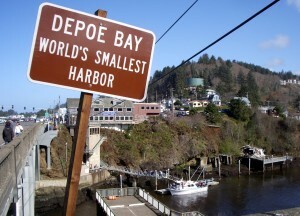 Depoe Bay has several distinctions. It has the world’s smallest natural harbor. Plus Depoe Bay claims to be the whale watching capital of the Oregon Coast – and with good reason. The natural features here, for instance Arch Rock, the spouting horns, and sea cliffs, and whales dominate life this community. If you enter Depoe Bay from the north the first stop of interest is Arch Rock. This amazing arch in the ocean a short distance from shore is a natural wonder. Next are the spouting horns. Waves enter the lava beds and create pressure. The water squirts through small holes and shoots high into the air. During stormy weather water can shoot up to 60 feet into the air. Children will enjoy visiting the Whale Watching Center is located in the central part of Depoe Bay. It has exhibits that explain whale behaviors and depict the history of whales. During winter and spring school breaks, the Whale Watching Spoken Here program places volunteers and good whale watching spots along the coast and Oregon Parks and Recreation Department park rangers are available at the Center to answer questions about whales. The Whale Watching Center also has a free theater showing whale movies. Just past the Whale Watching Center you will find the harbor where you can join one of the whale watching tours. Depoe Bay is fortunate to have a pod of grey whales that lives in the bay for 10 months each year. In addition to grey whales, you might also see Orcas, Minke, Humpback, Blue, and Sperm whales. These tours normally take about one and a half hours. As you head out to the open ocean to view the whales, you will also have the opportunity to see harbor porpoises, sea lions, bald eagles, seals and sea otters. Most of these tours are appropriate for children. At the harbor you can also make arrangements to go deep sea fishing. You can fish for Ling Cod and 20 varieties of tasty rockfish all year around. However, Chinook and Coho Salmon, Halibut, Albacore Tuna and Dungeness crabbing all have specific seasons. At the south end of Depoe Bay you’ll find Rocky Creek State Wayside. The rocky shoreline provides explosive wave action during storms. When the weather is calm, you can set on a bench at the ocean’s edge and look for whales that often play in Whale Cove. This park has breath taking views, but be sure to stay behind the vegetation line. Powerful waves can sweep you off the cliffs and onto the rocks below. Be especially watchful of children. Bring your whole family to visit Depoe Bay. The ocean, the whales, and the shops are waiting for you to come and explore. 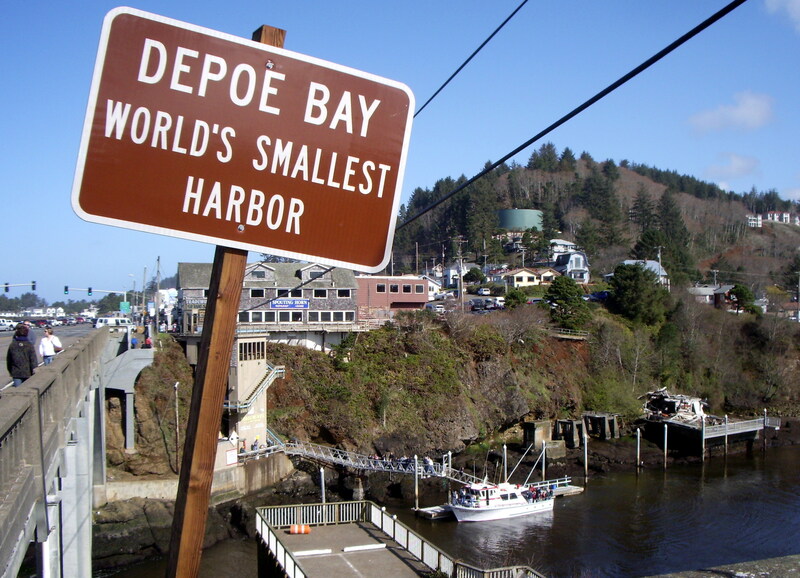 For more information please check out these additional articles about Depoe Bay.